Francois Boucher was one of the best drafters of the 18th century. With exceptional accuracy, he noted the smallest details of nature. Art historians believe that during his life, Boucher created at least ten thousand drawings in various techniques. Many of them are sketches for his future paintings. 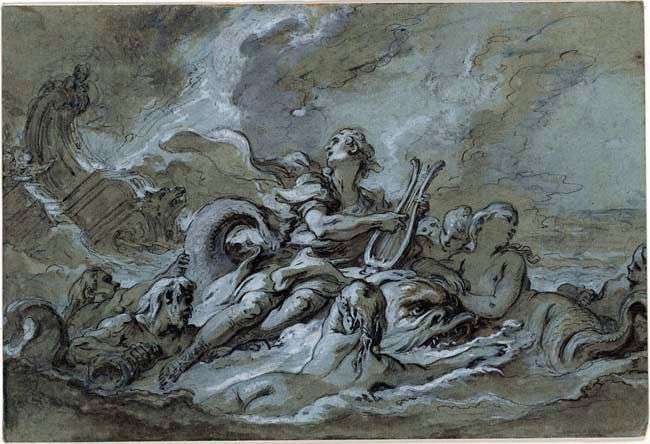 For example, the sketch presented above was used later when working on the painting “Water” from the cycle “Four Elements”, decorating the doors in one of the royal castles. In addition to the sketches, Boucher created completely finished drawings, each of which can be considered an independent work of art. In these cases, the master addressed, more often, to the female nature – both dressed and naked. Her picture “Naked on the bed” breathes her with a light and delicacy. Usually the artist drew black, red and white chalk on yellow paper, but sometimes used pastels and colored mascara. Already during his lifetime, the reputation of Boucher-draftsman was very high, as evidenced by the fact that his drawings were instantly bought up by collectors of painting. Some of them at the same time were more expensive than the “high-grade” paintings of other painters. Description and meaning of the painting A sketch of “Water” by Francois Boucher.